Two of the hens made a break for it today - three times, laughing in the face of my feeble barriers. Never underestimate the determination of a Brown Shaver. 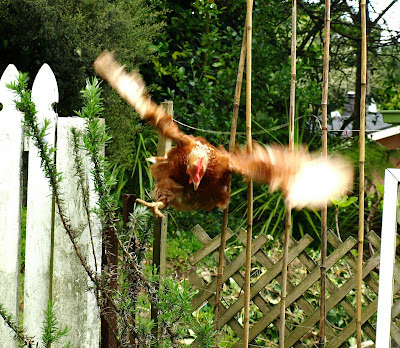 They're so keen to get to the grass on the garden side of the fence, having seen off every blade in their run, that they will launch themselves, madly flapping, at the most unlikely gaps, and through sheer brute force will blunder through. So it's the scissors for them tomorrow morning: flight feathers cut short on one wing so they're unbalanced. Tch. I wouldn't mind so much, but I've just sprayed all the weeds in the garden, and that's a condiment they can do without. We're lighting out for the Territory ourselves on Sunday: to Seattle, with a side-order of Washington state. It's going to be a busy trip, the itinerary sorted by helpful Tammy at the Washington State Tourism Office; but it will be fun and I'll enjoy seeing a new bit of America - and an especially scenic one at that. On my walk this morning, though, I passed a bright green bird hanging off a stalk of purple flowers, sipping the nectar, and never broke my stride. I glanced at tuis rustling overhead with a flash of blue-black feathers, and looked away again. 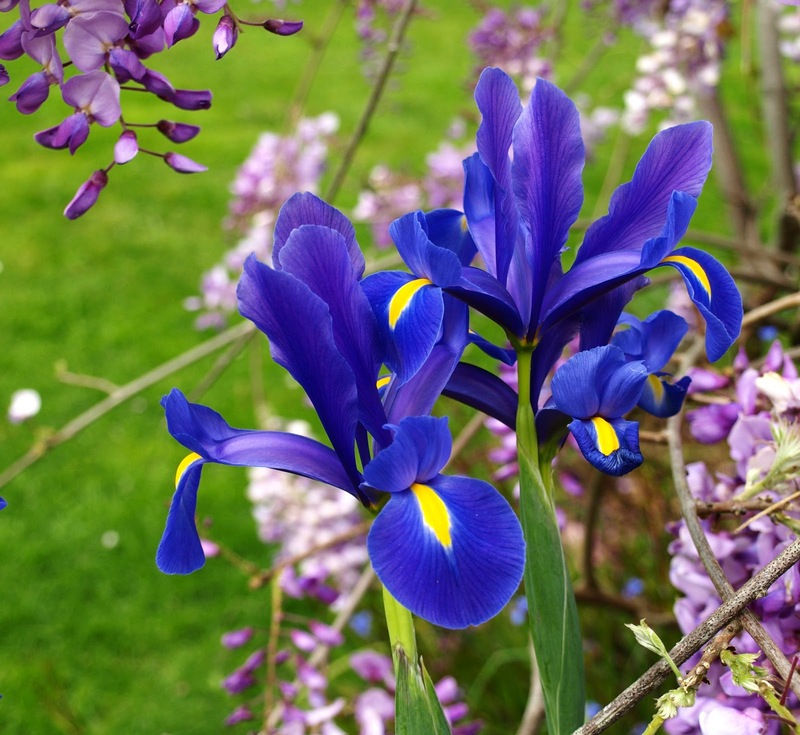 There was a great fat wood pigeon parked in a tree, its enormous breast a beautifully subtle teal colour; the yellow boat moored off Herald Island was bright in the sun; the new leaves were fresh green against the sky; and the irises are out in my garden at the same time as the wisteria with its heady perfume. It's a lovely time of year in a beautiful country that I take for granted and rarely think to photograph on an ordinary day. More fool me. Yeah, it probably is. OOPS! :) If you have a chance, you should check out the Bloedel Reserve while you're here - It's about $10 per person and you need a reservation but it's totally worth the time and effort if you're into that sort f thing. It's on Bainbridge Island and it's my absolute favorite place to go and enjoy nature at it's finest. Even if it does rain. Thanks for the tip - we will if we can.